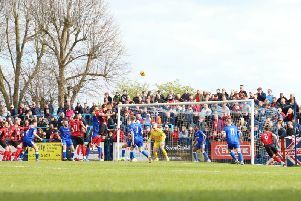 Kettering Town’s winning run was ended in a thrilling clash at Latimer Park. If nothing else, this was pure entertainment. We can and we will pick the bones out of the two defences on show but while any defensive coach would be having kittens about it all, anyone who was at Latimer Park as a neutral would have been delighted with what they got for their £10. Eight goals, two missed penalties and a game that swung one way and then the other. Yes, every fan wants to see their team winning but a bit of entertainment never goes amiss. If you paid money to watch this game, you got value for it. Despite their fine defensive record, there are things for the Poppies to look at. It seems remarkable that a team could concede twice as many goals as they have done on the road all season in one home game but that was something Kettering managed on this night. I don’t think anyone saw it coming but Redditch’s pace on the counter-attack and their impressive delivery at set-pieces caused the Poppies a number of problems. A wake-up call, perhaps. It just goes to show that just when you think you have cracked it, there’s always someone who is ready to come and show you that you haven’t. Kettering will have to learn to deal with those counter-attacks better and, in fairness, they coped much better in the second half but only after the damage had been done. Redditch bucked the trend when it comes to visiting Latimer Park. It’s not a myth or an excuse that is made up to cover up defeats or losses but teams have made a habit of coming to Latimer Park to sit in and simply stay in the game in recent times. There’s nothing wrong with that. This is, after all, a results business. But it was refreshing to see Redditch United, a team very much in form, come to Kettering and have a real go at them. They were quick and skillful in their attacks, their finishing was clinical and they caused huge problems for a defence that had been rock solid up until this point. You wouldn’t have found a single person in the ground who didn’t think the visitors deserved their late, late equaliser. They were well worth it and showed that they will continue to climb the table in the coming weeks. Dan Holman has already proven he was worth the investment. Plenty has been written and said about Dan Holman’s move to Kettering. I don’t know what they are paying him, it’s none of my business but whatever it took to get him to Latimer Park has been worth it. He is clearly playing below his natural level and he once again showed just how important he will be to the cause. His general play had been pretty good but, with the Poppies scrapping to get back into the game, he glanced home a Marcus Kelly free-kick and then scored a sublime goal when he took the ball down and calmly lobbed Reece Francis for what looked like it might be the winner. Holman is a class act and it feels like he is only just getting started. With him and Aaron O’Connor leading the line, goals really shouldn’t be hard to come by. December is always one the busiest and most important months on the football calendar as the season approaches the halfway stage. And for Kettering, it looks like there will be opportunities for them to strengthen their grip on top spot. They certainly won’t be allowed to breeze through the next few games but those immediately in front of them should fall into the category of ‘must take points from them’. It will all lead up to Christmas time and a showdown at King’s Lynn Town in the final game of the year before 2019 opens with the blockbuster against AFC Rushden & Diamonds at Latimer Park. If the Poppies are still in their current position or better after Boxing Day then they will be extremely happy.